I get tired of taking all the extra time to find my toothbrush and tube of toothpaste, and then after I find them going through all the hassle to squirt the toothpaste onto the toothbrush in a perfect toothpaste shape onto the toothbrush. The toothbrush and toothpaste combo builds a tube of toothpaste into the handle of a toothbrush. With the toothbrush and toothpaste combo you can give a little extra squeeze if you need a little extra toothpaste in tomorrow mornings brushing. 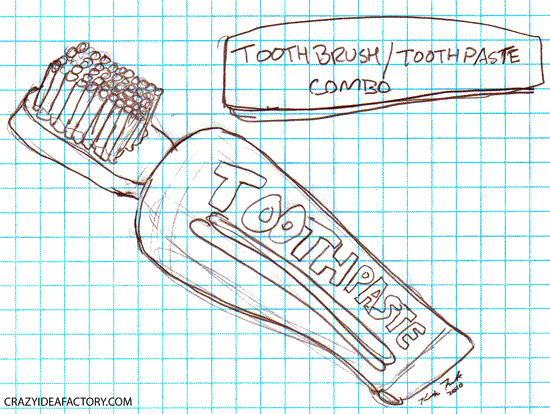 One Comment on "Toothpaste And Toothbrush Combo"
thats a very practical idea, may be add a slider on toothbrush that can be pushed by the thumb to fill in toothpaste on the brush tip.